In ALL honesty, I haven't been doing a lot on the home front. There is sooo much I want to do, but it takes time, money and waiting for one project to get done so I can move onto the next. I also feel a little overwhelmed with motherhood as of lately. I have been wishing, hoping and praying for another little bundle to grace our home, but month after month it hasn't happened. And in all honesty I have been pretty sad about the whole process and somewhat in a rut. I'm not complaining TRUST ME...My kids are my WORLD!!! It's just been one of those days and I need to remember that day to day problems are just that...ONE DAY! "Hands full now, Heart full Later"
I have some REALLY exciting elements I want to add around the fireplace, but the project is going to take some time, and MORE hard work, so until then, I decided to forget about the front room and focus on what I can finish and that room is the KITCHEN! I have been wanting my kitchen to feel cozy and warm, especially for the holidays and the upcoming cold weather. Soooo, I have been on the search for a rug, and I think I found it! Here it is in REAL life!!! I ordered this rug online from Target it was FREE shipping and it arrived at my front door last Friday! I couldn't be more excited about the outcome. I am REALLY loving the blues, greens and browns! I am almost tempted to paint my black island white with a glaze to match my other kitchen cabinets. What do you think? Should I do it??? I also saw this darling vinyl idea off one my friend's blog and I knew I had to do it too! EAT...I think it makes a fun statement. My kids have really had fun with it. I really believe it's the small details that REALLY make the difference in a home! Love it! That rug would go great in my dining room. I have very similar colors:o) Did you get the largest size? Better start saving my pennies so I can get one too;o)...good luck with making "blessing #4" happen. We all get into project burn out, creativity burn out, and motherhood burn out! 3 kids is a ton of work, I've got 3 and I'm plenty busy but I'd still love to have a little #4. Good Luck! You are so talented I love your style! I agree, Heidi! 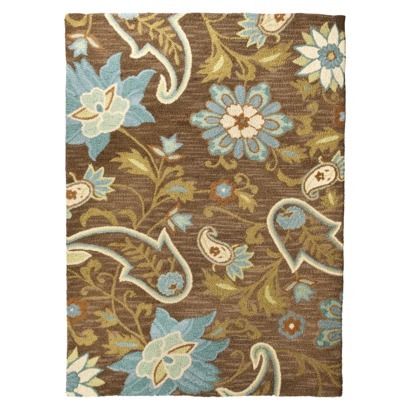 Love the rug-- gorgeous touch to your family space. Enjoy the weekend! Waiting for those precious bundles of joy is so hard, it has been torture for me the last few years. I have never hated the word "patience" so much! Love the rug! You could always paint your island a chocolate brown, white would be lovely too! Your new rug is beautiful and looks gorgeous in your kitchen! I love the vinyl table idea. I can totally sympathize with you, I'm a mom of 3 and I know it's a lot of work! But what blessings they are! Take care! Loooove the rug!! I really need to come see all this new fun stuff in person!! Hey honey, I love the rug! Will be perfect for my new space. Just remember that timing these things is not yours to determine and trust in His plan for you! I had some extra space between 3 & 4 and it was a blessing. And now I have 5! Hi Heidi! 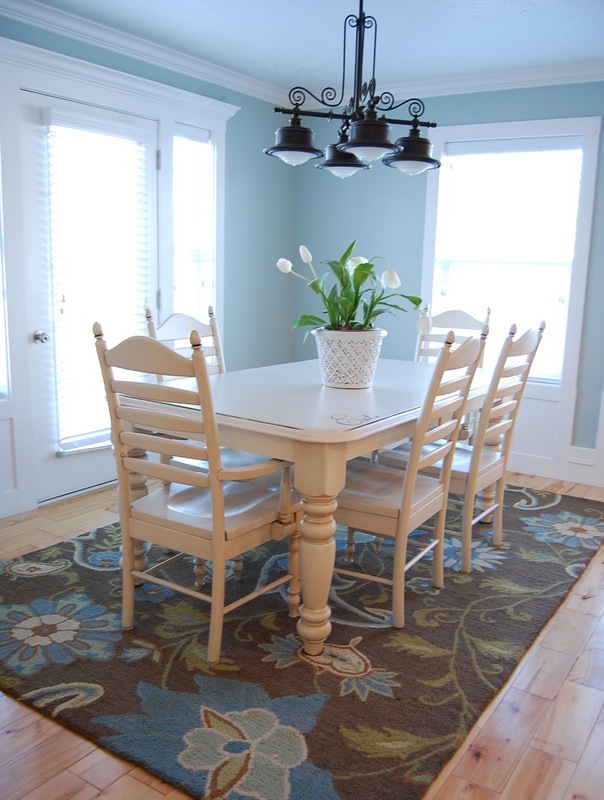 Love the rug and your light fixture is AMAZING too! I've seen that rug! I have been admiring it too! I can't remember where I saw it but I love it! I was thinking about using it for my bedroom. I love it in your kitchen! So sorry to hear this little bundle is being poky. I have 6 kids and 2 big gaps (4.5 years between #2 and #3 and 5 years between #5 and #6). There are definitely some advantages to a little space. You'll cherish this one all the more, and it's beyond wonderful to watch bigger kids enjoy the new little one. Best wishes to you. Did you paint the table yourself? If so, can you share the steps you took? I love it! Did you paint the table yourself? Do you mind sharing the steps you took? Love this look!